It seems to have worked. Company research shows that 88 percent of its customers are under 34 years old, and 45 percent are under 24. A prototype model similar to the Mvmt Gotham watch, which sells for $180 with a metal bracelet. The partners, who met in Santa Barbara, Calif., after leaving college, each had tried his hand at e-commerce and crowdfunding ventures, with middling success. While neither was what you would call a watch obsessive, both considered them important fashion accessories, but had a hard time finding a brand to fit their style sensibility and budget. They sought to create the kind of watch that they would want to buy. In an era of H & M-style fast fashion, they sought to produce watches that were head-turning, but also inexpensive enough that you could buy four or five. The strategy was to keep costs under $200 by selling directly to consumers online, eliminating the standard retail markup, and relying on social media for marketing. 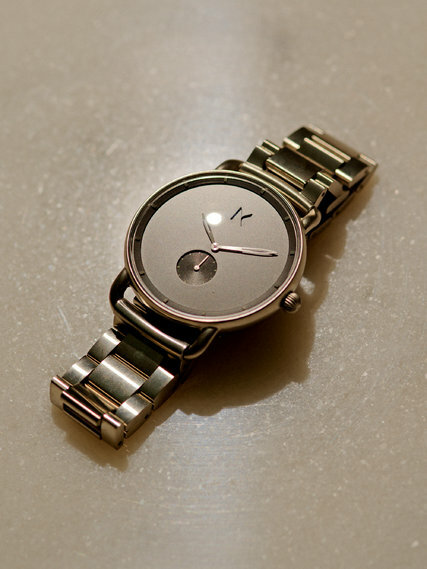 The Mvmt watches delivered sleek, hyper-minimalist design for prices that were roughly in line with the average monthly cellphone bill, and had, as they say, great branding. (Prices now range from $95 to $180). Timekeeping, clearly, was not the point. Mvmt watches largely did away traditional functional design elements, like numerals for hour markers, or luminescent hands. To set itself apart in the sea of under-$200 fashion watches, Mvmt positioned itself as an Instagram-first watch company. Its Instagram feed for its men’s line, for example, which has more than 855,000 followers, is a cornucopia of F.O.M.O.-inducing shots of stylish young lovelies cavorting in exotic locales wearing cool watches. And while the company experimented with celebrity endorsements, including Kylie Jenner and Klay Thompson, it seemed to find its footing with a social media star known largely to other millennials: Sam Kolder, a globe-trotting young videographer and thrill seeker with 585,000 Instagram followers and great abs.